Select the correct power cable depending on how the monitor will be powered and connect it to the monitor cable. 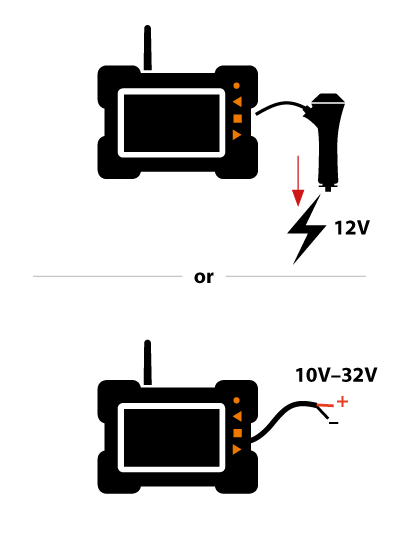 If the monitor is to be powered directly from the vehicle electrical system, connect the black wire to ground and the red wire to the positive pole of the electrical system. When the white wire is connected to the positive wire of the back-up light, the monitor automatically switches to Channel 4 when the back-up light is turned on. It is not necessary to connect the white wire if this function will not be used. If the monitor is to be powered via the 12V power outlet/cigarette outlet, simply insert the adapter into the outlet. Fasten the fan shaped monitor stand to the forklift truck, and then fasten the monitor to the stand. Connect the camera to the PowerBank and place the camera and battery on the intended location. If the camera is to be powered directly from the vehicle electrical system, fasten the camera bracket securely at the intended location. Use the extension camera power cable and connect the black wire to ground and the red wire to the positive pole of the electrical system.